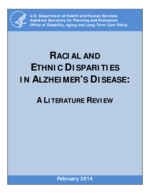 This study aimed to describe and characterize the published literature on disparities between racial and ethnic groups among individuals with Alzheimer's disease and related dementias. To identify relevant studies, we searched electronic sources for peer-reviewed articles and research reports published through 2014 related to the Alzheimer's population and their caregivers that provided evidence of racial and ethnic disparities, discussed reasons for disparities, or described interventions to address disparities. The literature shows consistent and adverse disparities among Blacks and Hispanics compared to non-Hispanic Whites in the prevalence and incidence of Alzheimer's disease, mortality, participation in clinical trials, use of medications and other interventions, use of long-term services and supports, health care expenditures, quality of care, and caregiving. The literature suggests numerous underlying causes, including factors related to measurement of the disease, genetics, socioeconomic factors, cultural differences, lack of culturally competent providers, and discrimination. Although these disparities are well known, little is known about the effectiveness of various strategies, such as cultural competence training, to address these differences within the context of Alzheimer's disease, with almost no studies available that evaluate possible interventions. Lisa M. Lines, PhD, MPH, is a health services researcher in the Aging, Disability, and Long-term Care group at RTI International, Waltham, MA. Joshua M. Wiener, PhD, is a Distinguished Fellow and Program Director of the Aging, Disability and Long-Term Care group at RTI International, Washington, DC.